As previously reported, Mega Man X Legacy Collection 1+2 will feature a new "X Challenge" mode that let's players battle two Mavericks at the same time. However, it now looks like there's a bit more going on here than we thought. According to a preview of this week's Famitsu, X Challenge will feature an original "story mode". It remains to be seen just how in-depth the story will be or if there's a unique story to Collection 1 ("X Challenge Volume 1") and Collection 2 ("X Challenge Volume 2"). Whatever the case, this is pretty interesting. Story mode might even explain that mysterious, seemingly new white armor we've seen in past previews. It's something to watch for. 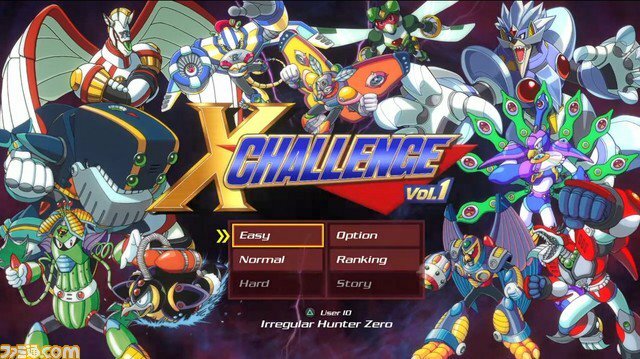 Also worth pointing out, a few Mavericks from Mega Man X Legacy Collection 2 are making the jump to "X Challenge Volume 1". 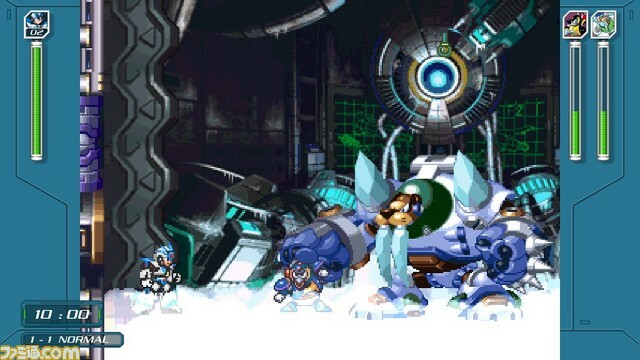 Duff McWhalen, The Skiver, Commander Yammark, and Blizzard Wolfang come from Mega Man X5 and Mega Man X6 respectively. We still don't know too much about who will be included in X Challenge Volume 2, though I don't believe we'll be seeing anyone from X7 or X8. There's been little to no evidence to suggest any of the "3D" bosses will appear. Expect additional details on Thursday when this week's Famitsu is officially released. Stay tuned! I like most of the US names better than the Jap ones & thought it was a cool homage/Easter egg to do since X5 was intended to be the last X game. Like, why not have a little fun with it? I don’t mind that the Clair voice actress from RE made the edits she did. Lol, glad to know I'm not the only one who adopts that idea. I didn't even see your post when I replied, about at hour after it (I guess they were all approved at once). Very similar! Is Duff Mcwhalen really dumber than Icy Penguigo? I hope they change the maverick names back. I mean, why does a game had to be tarnished by some woman wanting to make his (ex)husband chuckle? Nope. Everything is the same. You still want up and attack to dive directly into a pit in X6? True but it's like that for a reason. It could very well be part of the story. Calling it now. The story is going to be a training mission like the "training" level in x5 with Magma Dragoon. You meant Tidal Makkoeen and Spiral Pegassion right? You meant Tidal Whale and Spiral Pegasus right? I either say Tidal Whale and Spiral Pegasus, or Duff McWhalen and The Skiver. I feel that the former are their creator/design given names and the latter are aliases/nicknames they've picked up over the years. The Skiver definitely sounds like a soldier nickname, and Pegasus was in the Repliforce after all. The Japanese names for all the stage bosses across the series are stupid as hell sounding. They thought they were being clever with them, but at least names like Armored Armadillo make a lot more sense than Armor Armarge. So no, Tidal Makkoeen or Spiral Pegacion are stupid names and you're pretty silly for calling them that. I will grab PS4 version with 2 discs instead. A Japanese version. Who cares? Do you think you're special for mentioning the Japanese version or something? Interesting, even if it's really simple, a story mode is a nice addition. I never expected that. I bet it plays into the New Generation Reploids' Copy Chips. Or it could be a spin on X5/Xtreme's "past Maverick data" concept. But I like the former, because it gets me really hopeful for X9 happening, hehe. That's a really cool addition. Good on ya capcom. I hope this ties into 2 things. 2 Seeing as they took X's portrait straight from MVCI concept art... I hope the Buster sound signifies that in some new fighting game aka Capcom Vs. Capcom, X will finally be made right and not without mobile buster and also has chargable special weapons etc. Don't hold your breath on an X9 connection. Remember, fans thought that Megaman 9 and 10 were going to "bridge the gap between the Classic series and the X series" when they were first announced, but guess what, they didn't. At most, I'm expecting this to be an abridged story version of Megaman Xtreme 3.